As a top tier member of the airline's, priority upgrades are available for the frequent traveler of that program. If you are not a member of an airline prgoram, upgrades are available through other loyalty points (call an agent for help). Sometimes the airlines oversell their flights, so getting cash or a courtesy upgrade is available. Upgrades are usually on the cheap if the flight has an abundance of open seats. If you are a Business class member of a partner airline, such as a Star Alliance partner, the potential for an upgrade increases. It is sometimes difficult for agents who deal with unhappy customers, but even a simple gesture of kindness will get you an upgrade. 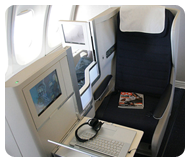 Ask an IFlyBusiness Agent on how to get an upgrade or a major discount in Business or First class.